The Wailea coastline of Maui is spectacular and the sunsets seen from this area are among the most beautiful you could find on Maui. You'll be able to see the West Maui Mountains, the island of Lanai, the island of Kahoolawe and the little inlet island of Molokini. The site of the Te Au Moana Luau is on this coastline at the Marriott and the views from the luau grounds here are among the best you will find on the island. 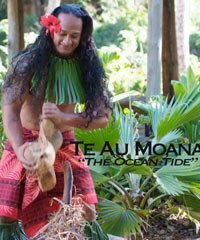 Tihati Productions is the company that has produced the luau here and the Te Au Moana show title in Hawaiian means the Ocean Tide. 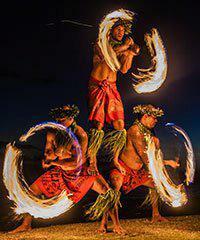 The show will encompass the song and dance of numerous South Pacific cultures and also the culture of old Hawaii as well. The food portion of the luau will be delicious and will include an all-you-can-eat buffet. An open bar will be available as well and this uniquely Hawaiian form of entertainment will be a delight you will fondly remember.